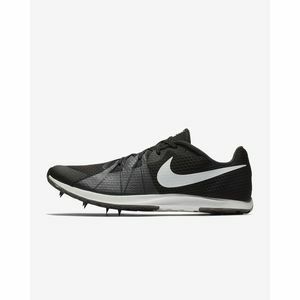 The Nike Zoom Rival XC Spike delivers an accommodating fit for an easy transition from your daily training shoes. It has been updated with Flywire cables and a dynamic arch band to provide secure lockdown over uneven terrain. Mesh uppers will encase each foot in breathable comfort. Perforations in the fabric increase airflow to create a better, healthier environment for your feet to thrive in. A dynamic arch band wraps from the lateral to the medial side to increase stability and lockdown over varied terrain; it unites with Flywire technology, which integrates feather-light cables with the bottom two eyestays, to eliminate millimetres of movement with each stride so that you can enjoy slick, distraction-free speed. Wider in the forefoot than traditional racing shoes, the Zoom Rival XC allows for comfortable toe splay and a more efficient push-off. The snug heel shape helps to secure the rearfoot while the knit-in texture of the laces keeps knots more secure than regular laces. Cushlon resides underfoot to deliver a soft, yet resilient, and responsive ride. Light in weight and low in profile, it spares your joints as you strike down onto hard, unforgiving terrain. Cushlon's reactive nature means your use of superfluous muscle power is reduced, so you can run faster or at the same speed for longer. The forefoot Pebax plate is shaped like a horse shoe and houses six spike receptacles for even pressure dispersal and superior grip. Translucent rubber covers the forefoot and heel, smoothing the transition from heel-strike to toe-off; it is removed in the midfoot to expose the outsole, enhancing flexibility while reducing weight. This also prevents mud and debris from clogging the outsole and saturating your pace. Strategically placed lugs have a sharp, crisp shape to yield grip in all conditions. The anatomical heel is rounded to roll with the ground, encouraging a more natural and fluid range of motion. For the athletes who crave a consistent fit for race day performance, choose the Zoom Rival XC.